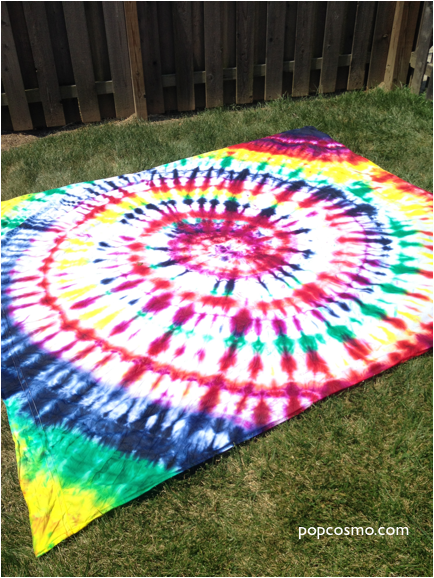 We're going to show you how to tie-dye a sheet in 10 minutes and your friends won't believe it! Call this sheet whatever you want: a beach sheet, a picnic blanket, or use it as a bed sheet, but everyone will be in awe that it only took a few minutes to make! With the summer picking up speed and the pool losing the allure it had the first couple of weeks, we decided it would be a great time to do something different! A picnic perhaps? When we went in the basement to try and turn up something to sit on; however, all we could find was an old stained bedsheet. How could we eat on a sheet that had a big stain on it, without feeling a little sick to our stomachs? Then the idea hit, tie-dye the sheet! What could be cuter than a perfectly tie-dyed picnic blanket? This was easy and to tie-dye it took no more than ten minutes (not including the drying time) and the results were well worth it! IINSTRUCTIONS: 1. Spread the bed sheet out across something that you don’t mind getting a little color on, preferably grass. 2. Pinch the center of the sheet and start to spin it in a circular motion, continue spinning until the entire sheet is curled up. 3. Take the rubber bands and put them on the curled sheet that you just created so it won’t come undone. 4. Use a hose to soak the sheet all the way through. When the cloth is wet, the dye spreads out easier and the result will be much better. 5. Now the fun part: tie-dye the sheet! Squirt the colors on the sheet. That's it! 6. Once all the colors are on, leave it out in the sun for about an hour, or until dry. 7. Unfold and admire.